Transport: (Lonavala to Base Village and Back to Lonavala). Note: Its possible to reach Malavli from Lonavala by local train and take local rickshaw from Malavli till base village of Visapur fort. Packed lunch will cost Rs.300/- per head. Breakfast - Rs.150/- per head. Evening Tea/Snack - Rs.100/- per head. Ex. Mumbai to Malavli Village and Back: Transport Rs.4500/- per Jeep (6 persons capacity). (Road tolls will be borne by the customer). For group size over 20 kindly call in person to discuss complete package cost. 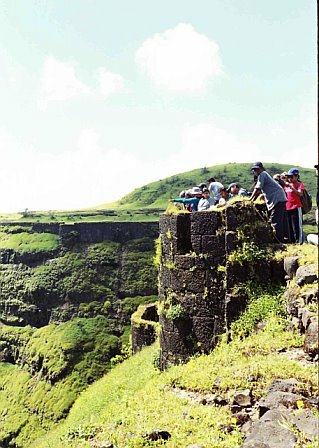 A Little Bit of Visapur Fort History..
Visapur can be approached by two routes; one route is to climb the trail leading to Khind between Lohgad and Visapur; follow the trail to your left leading towards Bhedse hill; along this route you will find a path which steeply climbs through a arête ending up into the fort, this is not regular entrance; we will use another route which starts from the stairs leading to Bhaja Caves; after climbing few steps you then take diversion to your left where a small trail climbs above the Bhaja Caves hill to takes you to a small plateau. From this plateau you can see the fort very clearly. You maintain your progress keep to the left hand side of the hill as you climb up along the walls till you come across a small waterfall (will be dry when we trek from here in November) and then from here a small trail leads you the start of stairs leading to the entrance of fort which has a Maruti Temple just few steps short of the entrance.